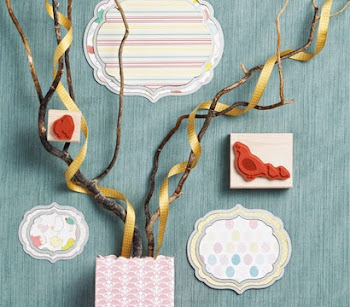 This is another of the cards from the November class. The ladies had a choice of which orientation they would use. This one here I sponged the strip of card stock with Crushed Curry, then Stamped the stems and the stamens in Early Espresso, and the flower buds in Cajun Craze. 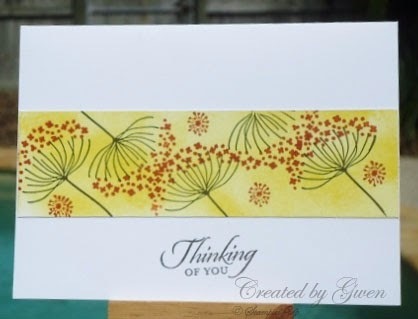 I then randomly stamped some smaller flowers from the Summer Silhouettes in Cajun Craze as well, This card literally took three minutes to make! 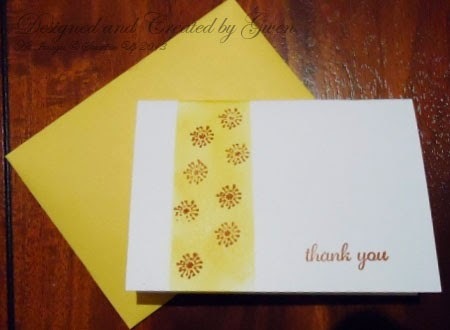 What the ladies did then was to make a gift card using the same method and stamp set, and to finish it all off they made an envelope from the New Envelope Punch Board, I love this new little tool from Stampin Up! I had such fun at this class Gwen. The cards, including these two were all gorgeous. I actually really love that these cards look so impressive and yet were relatively simple to make. Now maybe I need to buy that stamp set! Gorgeous Gwen. Love the colours AND I really love this stamp set. So much possibilities. TFS.